Modern 1st floor one bedroom apartment, twin bedroom with fitted wardrobes. Large bathroom with walk in shower . Galley style kitchen with all modern cons including a washing machine. Flat screen English TV. Balcony with pool and sea views with table and seating. 2 minute walk to the beach, restaurants, shops and bars, while still being in a tranquil location. Now with WI-FI and locally payable air con. Large bathroom with power/walk in shower. Washing machine located in bathroom. Flat screen TV with English Channels (BBC1/2, ITV, Channel 4, RTE1/2, Sky News). Includes corner sofa/sofa bed with patio doors leading out to balcony. Now with free WI-FI. Galley style kitchen with 2 ring hob, microwave, fridge/freezer, kettle, toaster etc. Comfortable seating for 3 at breakfast bar. 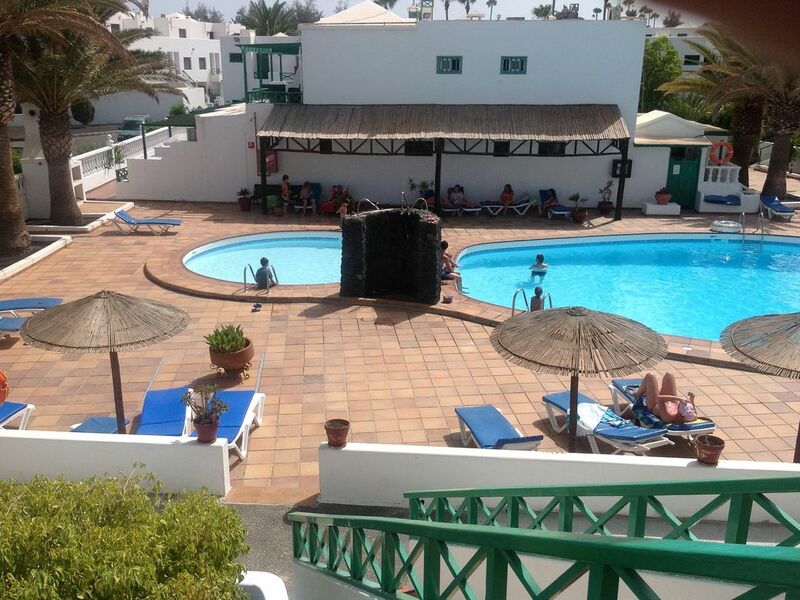 5 minutes from the Lanzarote Golf Resort. Notes on accommodation: The property is set in a secure complex with CCTV. Please note that inside the property is non smoking, but smoking permitted on the balcony. Outside: Balcony with pool and sea views. Shared main pool with separate children's pool. The pools will be heated from the 29th January 2012. Cleaning / Towels / Linen / Maid service: All towels and linen are included and the property is cleaned to a high standard before arrival. A lovely home from home apartment which was well equipped and had all the amenities. appreciate your comments and glad you had a good time. Spotless appt, well equipped, close to beach. The complex was kept very clean and the pools where cleaned. It was very relaxing stay for me and my wife. If any body else wishes to stay at this complex they would not be disappointed. Had a fabulous 5 days in this apartment in April. The apartment was only a few minutes walk from restaurants and shops and about 20 minutes walk to the main stretch of Peurto Del Carmen. The pool was heated so perfect temperature to have a dip, and a very good size. Plenty of sun loungers although people were out every morning before 7.30 am to put their towels out! Absolutely no need. The villa itself is ideal for a couple, or a young family. My only criticism is that there is no clothes storage in the living room where the sofa bed is, so you have to store everything in the bedroom wardrobe which is plenty big enough but just a tad inconvenient, but that is my only observation. Will definitely look to book again. Apartment Good, complex lovely,everybody friendly. The only problem was, the two complexes adjacent were getting major renovation work done and we had jack hammers/drills/sanders noise for the full three weeks. This work is due to finish before Christmas. The only thing I would say to Ben is tell people where the change of bedding is kept as we had a hard job finding it. 2 minute walk from the los Pocillos beach. Beautiful large sandy beach with all amenities. Arrecifi Airport is a 5/10 minute drive away. Car hire is not required. 5 minute walk from the heart of Peurto Del Carmen. Excellent restaurants, shops, banks, supermarkets, bars only a 5/10 minute walk. Please note that from the 22nd of August 2016 Super Fast Wi Fi is avilable at an extra cost of 36.00 euros per stay. Changeover Day: Optional change over day. Notes on prices: Standard rate: 290.00 Euros per week. Xmas/New year rates on request. Longer term rental rates on request.